PC Specialist has carved out a solid reputation as a provider of a wide range of desktop and notebook PCs. We've seen our fair share of review units and have been impressed by the quality of components and attractive price points for each model. Though the company offers an enviable array of options for performance PCs, cutting-edge performance is somewhat hampered by using off-the-shelf liquid coolers at the premium end. 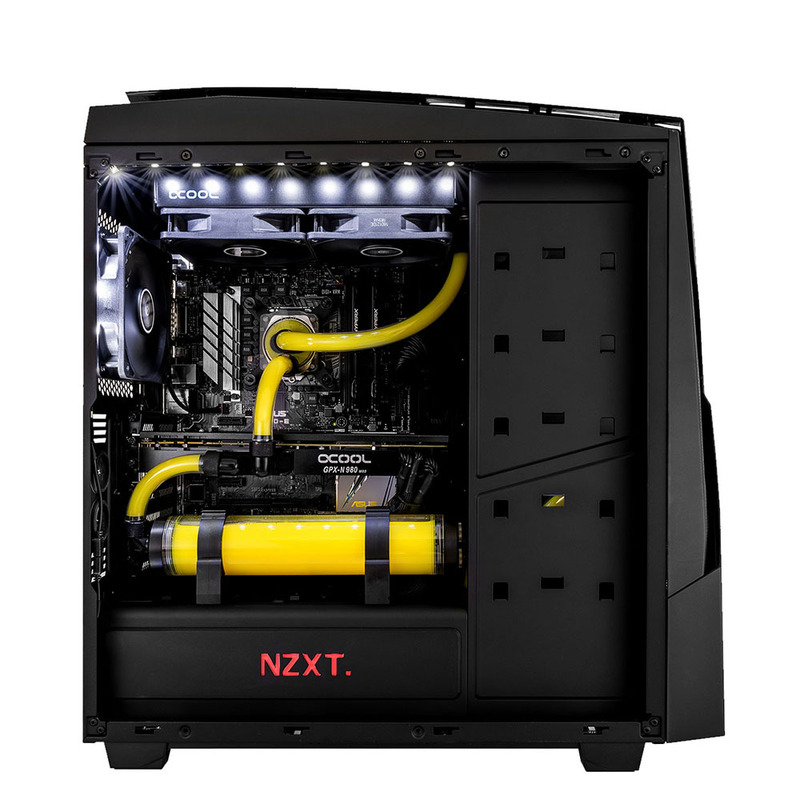 What's missing, one could argue, is bespoke liquid-based cooling that's both aesthetically pleasing and potent enough to enable PCs to be pushed that bit farther. 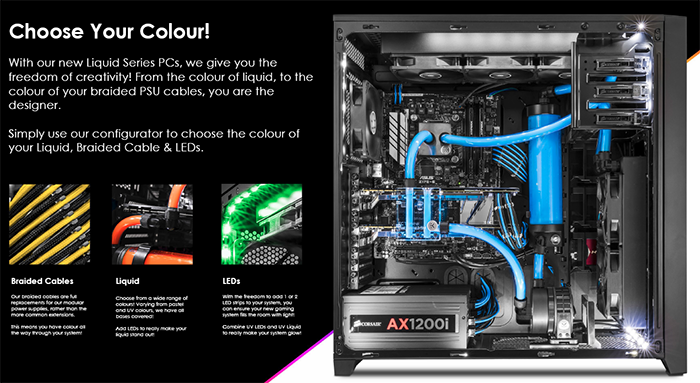 It just so happens that PC Specialist sees the merit in a fully liquid-cooled system and is today launching a range of machines under the Liquid Series banner. 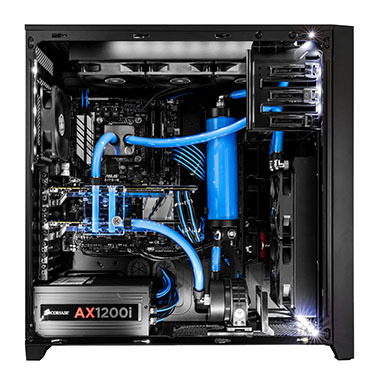 Brand such as Alphacool, CableMod, EKWB, Mayhems and Phobya are now part of the selection available to the gaming enthusiast, and appreciating that style often means as much as substance, the systems have matching braided cabling and LEDs. What's more, the company says it's also debuting revised 120mm fans, also dubbed Liquid Series, that are optimised for 30 per cent more airflow at the same speed. Starting at £1,299 for a base Intel Skylake configuration, PC Specialist is offering four cooling options for builds of progressively increasing performance. 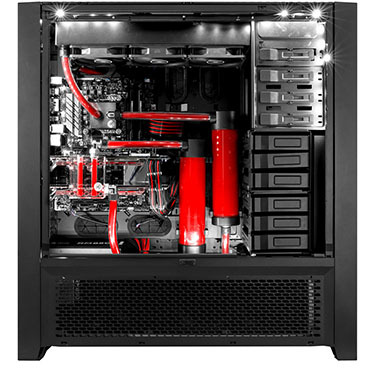 At the very top end is the Extreme kit that takes in two EK-CoolStream PE 360 radiators, two EK-X3 250 reservoirs, two EK-XTOP Revo D5 pumps, an EK Supremacy EVO processor block, and for the two GPUs, a couple of Alphacool GPX or EK FC Nickel blocks. Tasty, huh? The premise is to offer attractive systems for the discerning buyer. PC Specialist has more details right on over here. Take a look at the machines on the PCS site and let us know if you believe the company is on the right track in the premium end of the market. PC Specialist says it will offer customers a service pack for servicing their Liquid Series machines in the future. For a £149 fee, the company will collect and return the system once the loop(s) have been drained, flushed, cleaned and refilled. The tubing, too, will be replaced and a 24-hour stress test conducted before shipping back out. 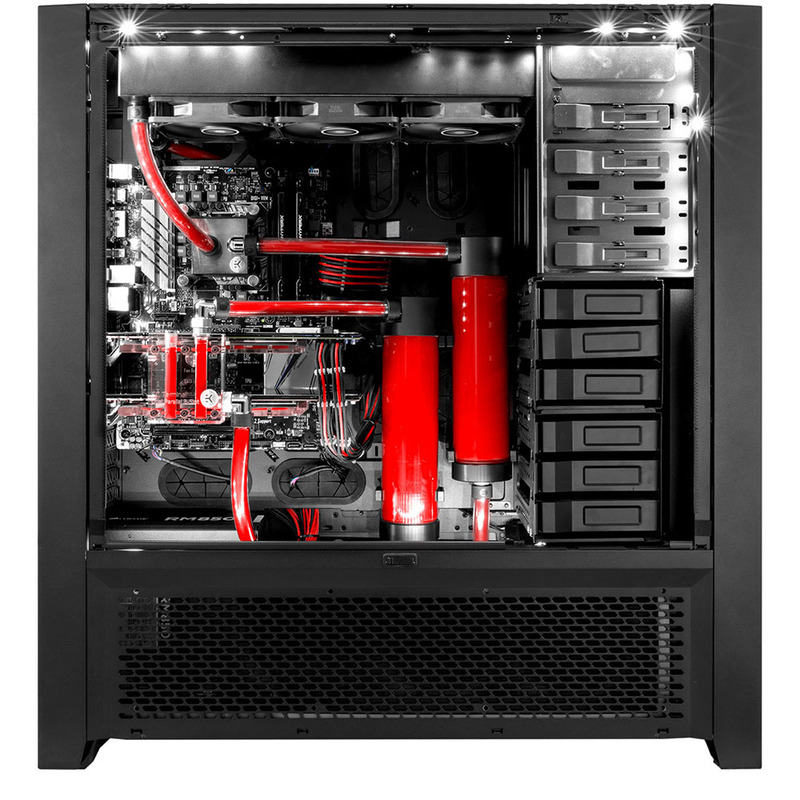 We have a mid-level Liquid Series PC en-route to us soon so keep an eye out for the editorial. Don't think it makes much sense to buy such a PC. Custom loops are a hobby and not a smart cooling solution. plz explain why there not a smart cooling solution ? my 8350 has ran at 5ghz for 3+ yrs never going above 55 deg c ? it's quiet and low maintenance? It's not smart because it's extremely expensive, has a very high maintenance and is complete overkill for most situations. If you think a custom-loop is low maintenance, you don't have a custom loop: the radiators love dust, the liquid has to be frequently refilled, sometimes replaced and if you want to replace a part, the whole system has to be emptied. 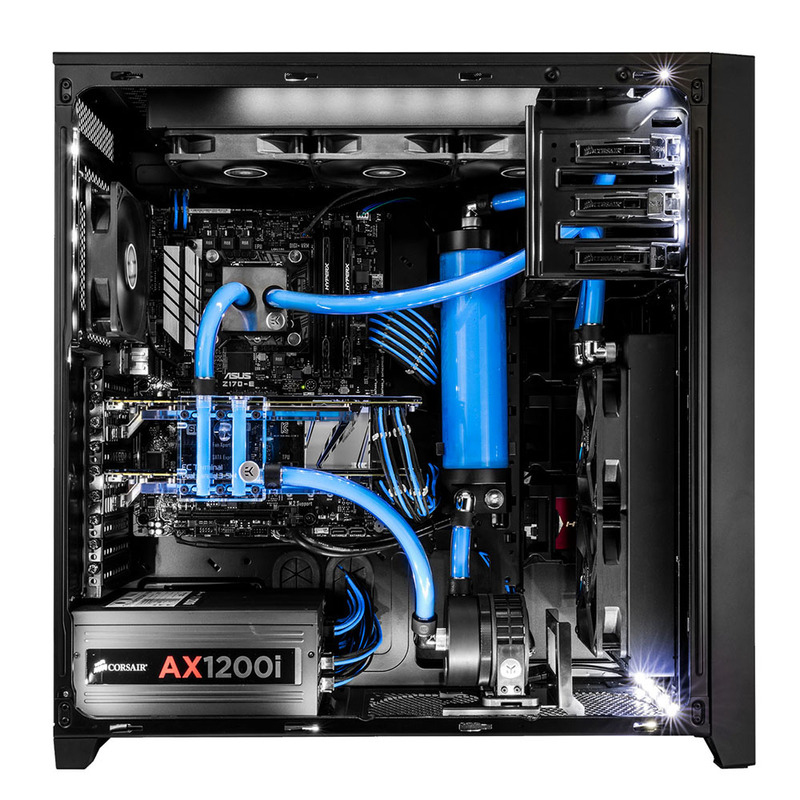 For most people air-cooling is ideal, while high-end gamers and enthusiasts are perfectly fine with an AiO solution. Custom-loops are something you do for fun and to show off, what you get for your money is prestige, not efficiency. I will accept that custom loops are a lot of fun but disagree that they are for show off (although some people do that). I run a custom loop because it is quiet - a lot quieter than air cooling, but only if you are cooling both GPU and CPU. And yes they do require some maintenance but not as much as you suggest. A properly designed custom loop is easy to fill and empty which only needs to be done once a year (not frequently) and takes 30 mins at most.